When he was a teenager, Ed Grisamore believed he was spending too many Saturday afternoons working in the yard. He was convinced his father would never achieve true happiness until he had moved every tree and shrub on the property at least twice. But his dad was teaching him valuable lessons. Not only did his father instill in him a strong work ethic, he set high standards for the job. “In my haste to finish, I sometimes would try to get by with the least amount of effort,’’ writes Grisamore, an award-winning columnist with the Macon Telegraph. 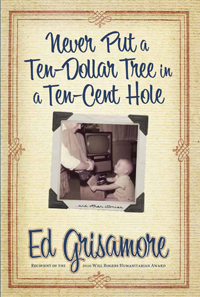 “My holes would be too shallow or not wide enough to accommodate the tree’s roots.’’ Taking the title from his dad’s sage advice, Grisamore’s seventh book, Never Put a Ten-Dollar Tree in a Ten-Cent Hole, pays tribute to everything from fatherhood to everyday heroes, as well as good sports and Good Samaritans in a collection of more than 100 newspaper columns and essays. Grisamore takes the reader from the smallest church in America to an oldfashioned country store to the nursing home where a munchkin from the Wizard of Oz now lives and the Mississippi town where Elvis was born. There are more stories about his dad and Grisamore’s own pride as the father of three sons. He puts a human face on every story and his themes cover slices of life from faith, food, animals, music, school, travel, children, veterans and the wisdom of the generations. He also shares his thoughts about his personal journey and the delights of the writing life.